“Well, that is a false choice,” she continued, explaining the need for an American foreign policy that encompasses so-called soft issues, like the advancement of women, economic development and energy diplomacy, as well as the usual “hard power” concerns. At various times during her speech, she held her right hand aloft and lightly touched her index finger and thumb together, as if to illustrate the concept of something that was both delicate and precisely calibrated. Her approach to the job of secretary of state—a four-year effort to balance military might, women’s issues and diplomacy—as well as her overall investment in a career that spans more than two decades in Washington, have also been exercises in patience, balance and fine-tuning. Despite the inescapable fixation on Clinton’s brand of femininity (right down to the designer of her shoes), as well as her claims concerning her women-oriented policy priorities, the balance of her work as secretary of state has actually favored muscle over soft power. Clinton pressed to send additional troops to Afghanistan, lobbied for military intervention in Libya and supported a more aggressive targeted-killing program. “They are often discriminated against, even brutally enslaved, or simply not able to contribute to society or realize their potential,” Clinton added. “We have an obligation to stand up for their rights.” And she has worked hard to create programs that will help create gender equality, promoting women’s right to education and addressing problems like the high rate of female fetuses aborted in China. In one of her most important achievements, Clinton shined a spotlight on the dangers women face in war-torn countries. She went to the Democratic Republic of Congo during her first year as secretary, for instance, and met with women who had endured sexual violence. She also pushed for United Nations Security Council resolutions that “have put real teeth into tackling the issue,” Bunting wrote, including the appointment of a special representative on sexual violence in conflict, and the creation of a team of experts responsible for tracking down its perpetrators. But some view Clinton’s impact in a different light. “There were moments with Hillary Clinton when I felt like we were getting too close to a rescue narrative: ‘Here’s Hillary Clinton and here’s the United States. We are going to save the women of the world,’” says Mallika Dutt, the president of Breakthrough, a human rights organization. At the Office of Global Women’s Issues, Verveer and her staffers have assisted women in countries around the world who are fighting sexual violence and other crimes. In July, for instance, officials announced that the United States would contribute $5 million to a public-private partnership, Together for Girls, that works to reduce sexual violence in Kenya, Haiti and other countries. The office also funds workshops through the Small Grants Initiative, such as the one-day conference for the Female Lawyers Association in Gambia in August 2011, and helped lead the China-US Women’s Leadership Exchange and Dialogue program, which brought together female leaders from both countries. As secretary of state, Clinton has “mainstreamed” women’s issues, just as President Jimmy Carter once did with human rights, says Alan Henrikson, a director of diplomatic studies at the Fletcher School of Law and Diplomacy at Tufts University. The State Department’s annual human rights report now includes information on the legal age of marriage in every country, showing the places where girls are routinely forced into early marriage. In Yemen, for instance, there is no minimum age, and girls as young as 8 can be forced to marry. Aside from helping draw attention to the plight of women and girls in Congo, Clinton has led a widely publicized cookstove initiative to raise awareness of the dangers of primitive stoves in the developing world. Cookstoves, which cause diseases and illnesses such as pneumonia, kill 2 million people a year. These stoves also produce black carbon, one of the biggest causes of global warming. In 2010, Clinton said that the United States would commit $50 million toward the Global Alliance for Clean Cookstoves, an organization that aims to convince people in 100 million households around the world to switch to cleaner stoves. Since then, that figure has increased to $105 million, with yet more funding to come. “She was genuine about the stoves, as it turned out,” says New York University’s Richard Gowan, an expert in international cooperation. Critics argue, however, that the new stoves don’t make a difference: in fact, some of the new models cause more pollution than the old ones. In addition, as one study by Harvard and MIT researchers showed, families who received the new stoves did not use them properly, or stopped using them altogether after a few months. In that study, they essentially gave the stove away and did not find great results. “I’m like, ‘Big surprise,’ says the State Department’s Jacob Moss, director of the US Cookstoves Initiative. He explained that the study showed that technology alone, or simply giving away better stoves, is not enough. Instead, experts have to look at the problem holistically, which, he says, is what he and others at the State Department are doing. Girard and her colleagues have also attempted to help HIV-positive women in developing countries have access to contraceptives, which would reduce unwanted pregnancies and minimize the risk of mother-to-child infections. US government officials could approve money for contraceptives at HIV clinics. Data on child marriage, which is measured by the percentage of 20- to 24-year-old women who were married by age 18 in a particular country, show how long it takes to improve the lives of women and girls. In Nicaragua, for example, the decline in child marriage over a five-year period from 2001 to 2006 was just three percentage points, from 43 to 40 percent, according to Malhotra. The next review of trends will not be released by UNICEF until 2014; at that point, the impact of Clinton’s efforts to fight child marriage will be easier to measure. Meanwhile, some changes in the world have made the situation harder for women. “US foreign policy creates conditions for enormous amounts of violence against women,” says Breakthrough’s Mallika Dutt. “It is ironic—I don’t think [Clinton] would have been able to get much traction on women’s issues if she hadn’t been seen as being tough in these other spaces.” Many believe that Clinton has struck the right balance overall as secretary, achieving enough good in the world for women and girls to offset the harm America is inflicting. But it may be years before her real legacy becomes known, as the fate of people in Libya, Pakistan and other countries makes it clear whether she managed to help women and girls and also promote US interests through her brand of realpolitik, or whether the US interventions set the whole society back. 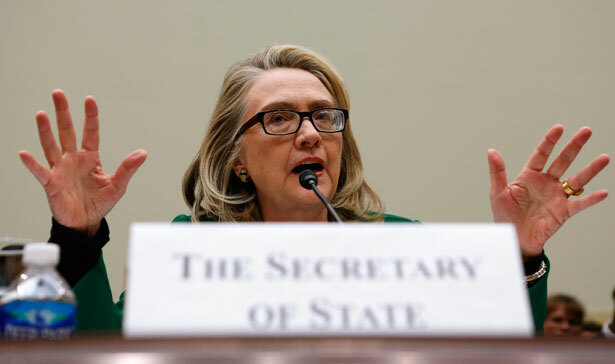 With boundless enthusiasm, Clinton has shaken things up in Washington, at least stylistically. And she certainly put her listeners at the Council on Foreign Relations in a good mood. After her speech, she made her way through the room, gossiping with old friends and shaking hands with other people. Smiling and waving, she looked like someone on the campaign trail.